This entry was posted in Google Canada Blog and tagged #GoogleCanada, Canadian, Google Holiday, holiday, insights, shopping, Think Insights on December 15, 2016 by Aaron Canada. Updating Your Holiday Hours on Google? Easy as Pumpkin Pie. This entry was posted in Google and Your Business and tagged 2016, Business, Google Maps, google my business, Google+, holiday, Livestream, mobile, mobile optimization, mobile sites on November 23, 2016 by Google Small Business. This entry was posted in Google and Your Business and tagged AdWords, Adwords Express, Business, Google AdWords, google my business, Google Small Business, Google+, holiday, mobile, mobile optimization, mobile sites, small business on October 21, 2016 by Google Small Business. The weather’s heating up, kids are out of school, and that means only one thing: summer’s officially here. Summer brings weekend road trips, faraway escapes and all kinds of getaways in between. And with the latest update to Google Maps, we're introducing two new features to get you where you’re going and help you remember your travels in a brand new way. Road trip warriors can now get multi-stop directions in Google Maps on Android (coming soon to iOS). Just open the app, enter a destination, tap the corner menu, and then click “Add a stop”. To rearrange the order of your stops, tap and hold the three dot menu to the left of “Add stop” and drag it to the position you want – you can even search for types of places like gas stations or restaurants like you normally would. Once you’ve added all your stops, tap “Done” and your multi-stop route is complete. When you enter navigation mode you’ll have the same seamless driving experience you’re used to, whether you’re going from errand to errand or hitting scenic spots along Route 66. No matter where your travels take you this summer and beyond, these new Google Maps features will get you there and help keep track of all the memories you make along the way. This entry was posted in Google LatLong Blog and tagged Android, directions, GMM, Google Maps, holiday, LatLong, navigation, road trips, summer, travel, Your Timeline on June 30, 2016 by Lat Long. 2016 is just around the corner. Before we pop champagne and ring in the New Year, let’s take a look back at the enhancements we’ve made to Google Maps over the past year. From using Google Maps offline to discovering new places with Explore, we’re proud to not only get you from point A to point B quickly and easily, but to also help you explore the world around you with confidence. Below is a list of the new features you might’ve missed, along with a handy chart showing you where you’ll find them. If you got a new phone this holiday season, now’s the time to give the Google Maps app a go. 2015 is ticking away, but you can take a look back at the places you’ve traveled with Your Timeline. Always know when your favorite stores are open with up-to-date holiday hours and alerts. Whether you’re in a parking garage with no signal or traveling in country with expensive data, search for places, get directions, and turn-by-turn navigation–all offline. Always stay on the fastest route and beat bumper-to-bumper traffic with real-time traffic updates and dynamic re-routing. Never run low on fuel with up-to-date gas prices in search results and on the map. Make quick pit stops without long detours–search for places along your route without leaving navigation mode. Find the best local spots to eat and drink with curated recommendations. Get all your travel options and compare ETAs across driving, walking, biking and transit–all on one screen. Get the scoop on when the lines are shortest and shops least crowded by checking businesses’ most popular times–by day, by hour. Get the lay of the land before you arrive by using Street View thumbnail. Never miss a bus or train with real-time transit information (schedules, fares, updates) in more than 18,000 cities across 64 countries. Get directions, turn-by-turn navigation and real-time traffic updates from your wrist with the Google Maps app on Android Wear and Apple Watch. To see these new features in action, take a look back at our Maps Minutes Holiday Hacks series. Join us in a virtual toast to a New Year of helping you explore and navigate your far away travels as well as your everyday life. This entry was posted in Google LatLong Blog and tagged Google Maps, Google Maps for Mobile, holiday, LatLong on January 1, 2016 by Lat Long. Whether you’re heading to a friend’s house for a cozy gathering, going to watch the ball drop in Times Square or attending an extravagant masquerade ball, the last thing you want to worry about on New Year’s Eve is driving. With the Google Maps app, you can get where you’re going without ever getting behind the wheel. Earlier this year we launched a new feature that allows you to see various transportation options and compare travel times–all on one screen. Once you enter your destination in the Google Maps app, you’ll see four options to get there: driving, walking, biking or transit (bus/train). You can quickly compare ETAs and switch between the transportation modes for more details and up-to-date information for each option. If you’re heading to a casual celebration not so far from home, walking or public transit might be your best option. The Google Maps app will give your walk time ETA along with a few transit route options with real-time schedules, updates and fares. Google Maps can also help you grab an Uber, if arriving by bus or train isn’t your holiday style. You can see the estimated trip duration, pickup time and estimated cost once you scroll down to the bottom of the app's transit option screen. Stay safe with Maps Minutes Hacks and enjoy your New Year’s celebrations wherever they take you. This entry was posted in Google LatLong Blog and tagged Android, biking, directions, Google Maps Navigation, Google Maps Transit, holiday, ios, LatLong, navigation, Transit, walking on December 29, 2015 by Lat Long. This time of year, millions take a road trip home for the holidays or adventure to faraway places all over the world. Whether you’re traveling abroad or rediscovering your own hometown, it helps to be able to navigate quickly and easily, even with limited mobile data or a spotty internet connection. Google Maps offline, now available on iOS and Android, can help you get the most out of your holiday travels. You can browse pre-downloaded map areas, search for places, get directions and turn-by-turn navigation–all offline. Because exploring the world shouldn’t require a data connection or excessive roaming charges. To navigate offline, simply open the Google Maps app and save any area on the map while you have a connection. Search for a place like San Francisco or Mexico City, open the place card and tap the download button. You can adjust the size of the map area you want to download and name it. Once downloaded, that area will be automatically added to your Offline areas in the side menu. Once you’ve saved a map area, you can search for places and get directions offline. Looking for that famous art gallery or a neighborhood watering hole? You can check out addresses, opening hours, phone numbers and even navigate there–all without internet access. To explore and navigate the world offline, install the Google Maps app on your iPhone before your holiday journey, or open it on Android along the way. 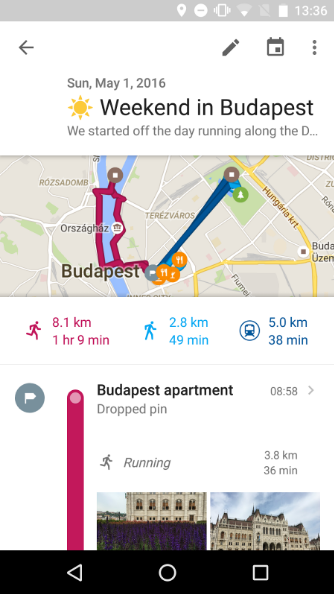 Get the most of your holiday time with Maps Minutes Hacks. Next up: how to get around faster and safer. This entry was posted in Google LatLong Blog and tagged Android, directions, Google Maps for Mobile, holiday, ios, iPhone, LatLong, navigation, offline maps, travel on December 22, 2015 by Lat Long. The holidays should be a festive time of year, not frenzied. But there’s no need to panic: our community of YouTube gurus is here to keep calm this holiday season with more than 135 million how-to videos. From figuring out what to do with your leftovers, pleasing your vegan guests, or keeping your kids occupied with holiday-themed activities, these Canadian YouTube Creators have the answers to all your holiday questions. Whether it's throwing a formal dinner party or entertaining last-minute guests, you're likely to host guests at least once over the holiday season. To impress your guests when they arrive, The Domestic Geek, has tons of easy-to-make crowd pleasers, including the classic cheeseboard, herbed popcorn, sweet rosemary bar nuts and 3 delicious party dips. The holiday season means parties galore. Although you want to look your best at all times, you also don’t want to break the bank. Canada’s beauty guru, RachhLoves, shows you how to put together an entire holiday look (outfit, shoes, jewelry, makeup) for under $100. How to clean your space post-holidays: Cleaning up your holiday decor or cleaning once your guests have left can sometimes be the worst part about the holidays. Not to fear, Melissa Maker of Clean My Space has all sorts of tips for how to clean up post-holiday, including how to clean up after a party, holiday meal cleanup tips, and holiday decor cleanup. We hope these YouTubers' tutorials can help you impress your guests and loved ones this holiday season. Have a safe and happy holiday! This entry was posted in Google Canada Blog and tagged holiday, How-to, How-to videos, YouTube, YouTube Creators on December 17, 2015 by Aaron Canada.